United Reggae offers the seventh free digital music sampler together with this issue. It contains 18 tracks from several of the artists that are covered in this sixteenth issue such as Glen Washington, Tarrus Riley, Norrisman, Tetrack, Rod Taylor and more. You can choose to stream or download it. 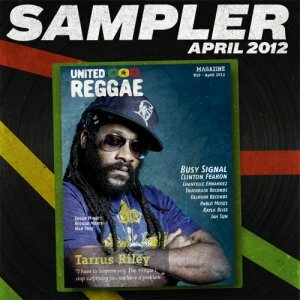 This music sampler is available for free download with United Reggae Magazine #18 - April 2012. You can't distribute, share, copy nor sell it. All the tracks in this sampler are courtesy of the authors -that own the whole rights- for this sampler only and can't be used for anything else.